The stock enquiry is the lowest level of information in the App, at product/location level. It is also the most important, because all inventory calculations are performed here. Clicking the Location name displays the stock position and status in each location. From the stock status in other locations, decisions can be made to transfer stock from nearby locations in lieu of buying from the supplier. For example: this might be possible should one location be a potential stock-out (or stock-out) while a nearby location is in excess. The key outputs are ideal order recommendations and the status of the item. The screen is structured into panels and tabs. Details; displays primarily data from your ERP, including key inventory information such as the preferred supplier, average cost and stock on hand. Demand; displays the sales history, sales in the current period, the future forecast, along with sales and forecast averages, and the age of the item. Safety Stock; displays the parameters, policy settings and inputs into the safety stock calculation. Fill Performance; displays the last 30 days of in stock and out of stock information, along with the target service level and actual service level achieved. Note: The red snowflake indicates that there are forecasts that have been manually entered and “frozen”. This means that these forecasts will not be overwritten by the forecast engine the next time a forecast is generated. Hovering over the mini-chart displays a table showing the actual numbers. Hovering over the Avg FC label or value, a popup will display the forecast risk and offset days. Hovering over period to date (PTD) sales displays sales as a percentage of the month’s forecast, then compares that to how far through the period we are. In this example, the sales are tracking the forecast quite closely as the two bars are aligned. The safety stock panel shows the key inputs to the computation of the safety stock days for the item. Target fill; the level of product availability that we are targeting for this product. Effective RC; the maximum of either the replenishment cycle (RC) or the minimum order quantity (MOQ). For example: if you had an RC = 45 days and the MOQ forced you to buy 65 days worth, then the effective RC would be 65 days. Lead time; the lead time from the supplier including placing the order, the supplier shipping, receipt into the warehouse, to the product being available for sale. Supply risk; a measure of how well the supplier delivers to the agreed lead time. Late deliveries and/or short quantities lead to higher risk. Forecast risk; a measure of how well we can forecast the demand for this product. Under-forecasting (forecasting lower than actual sales) leads to a higher risk. = Safety stock; the number of days of safety stock that this product requires in this location to achieve the target fill rate considering the inputs, constraints and policy. The top part of the Policy panel shows the calculation of the ideal inventory levels; the middle part compares those ideal levels with your current inventory position to determine what to order, when to order and how much to order; and the bottom part shows the Status of the item. Reorder Point; a trigger point to determine when to order. The formula is lead time + safety stock. The status is determined by comparing the Net stock in units with the Reorder point and Order up to levels. A description of the status values can be found on the dashboard page. The Fill Performance panel shows, for the last 30 daily imports (from your host ERP system), whether you were in or out of stock. Each vertical bar represents a date of import and not how many imports were done. The height of the bar indicates the level of stock on hand. The Forecast tab shows an item’s sales history and the sales forecast for the next 12 months, in tabular and graphical form. The forecast is a critical input to calculating the ideal inventory levels, and in determining what to order, when to order and how much to order. Hovering over the current period displays period to date (PTD) sales as a percentage of the month’s forecast, then compares that to how far through the period we are. When reviewing the forecast for an item, historical sales are an important input. However, sometimes those historical sales figures are low because you ran out of stock - if you had more stock, you could potentially have made more sales. The small bars under the historical sales figures show any stock-outs in that month. The bars fill up red, to indicate the number of days in that month the item has been out of stock. Longer red bars mean that the item was out of stock more often that month. Hovering over the line below the sales quantity, displays the number of days that this item was stocked out in the month. Click the amend forecast button to make any adjustments to the forecast based on information or events that the App would have no knowledge of. The Forecast shots tab displays the history of the sales forecasts, with each month end rolling a new forecast into history. Forecast history is just as important as future forecasts in that it tells us how well the forecasts are tracking the sales. The Purchase orders tab displays all open and outstanding purchase orders, and the data is refreshed with every data import. Any purchase order where the Expected Arrival Date (EAD) date is older than or before the last import date, is regarded as late and the EAD will be shown in red. If the EAD date is equal to or after the last import date, the EAD will display in green. The total number of units outstanding on purchase orders is shown in the red dot on the tab heading, indicating that there are open purchase orders to view. Every delivery from your suppliers is monitored from a time and quantity perspective, to determine the reliability of the supply of this item to this location. The average LT calculation takes into account the delivery quantity and the bias towards late deliveries i.e. the risk to your fill rate or product availability. Note: to view details of every delivery, click on the Table option. To extract the delivery information to a file, simply click the CSV download button. The measured LT is purely an average of all deliveries for an item that meets the criteria for inclusion. The graphic shows a separate dot for each historical delivery, where green dots are included in the calculation and grey dots are excluded. The calculated measured LT and the Stated LT for this item (along with the source of the Stated LT) is shown. Tabular data can be viewed by clicking the Table button. If the source for lead times in the App is set to Measured by historical deliveries, then the measured LT is used as the stated LT for this item. The stated LT is used for planning and replenishment calculations. It is important to note that 3 or more usable deliveries for this item in this location from the primary supplier, are required in order to use the measured LT for the stated (planning) LT. If there are not enough usable deliveries, the calculation is extended to use the deliveries for this supplier to THIS location, and then to this supplier to ALL locations. Finally, if this does not produce the requisite 3 usable deliveries, the measured LT is calculated as the average of all historical deliveries. The Customer orders tab displays all open and outstanding customer orders, and the data is refreshed with every data import. Any customer order where the requested date is older than or before the last import date, is regarded as late or overdue. The total number of units outstanding on customer orders is shown in the red dot on the tab heading, indicating that there are open customer orders. The Bill of materials (BOM) tab displays the BOM structure for any BOM where this item is either a raw material, semi finished good or finished good. Click on the Table button to see a summary of the demand for this raw material/semi-finished from all finished goods/semi-finished goods above it in the BOM structure. Note: Clicking on the finished good product link (FG200), will open the enquiry for FG200. Shows the item you are viewing in the enquiry, as well as one level of direct ascendants and one level of direct descendants. This is the simplest view of the BOM. A similar view to Direct except the graphic extends up to all direct ascendant pure finished goods and down to all direct descendant pure raw materials. A similar view to Line except the full BOM for each pure finished good is shown. 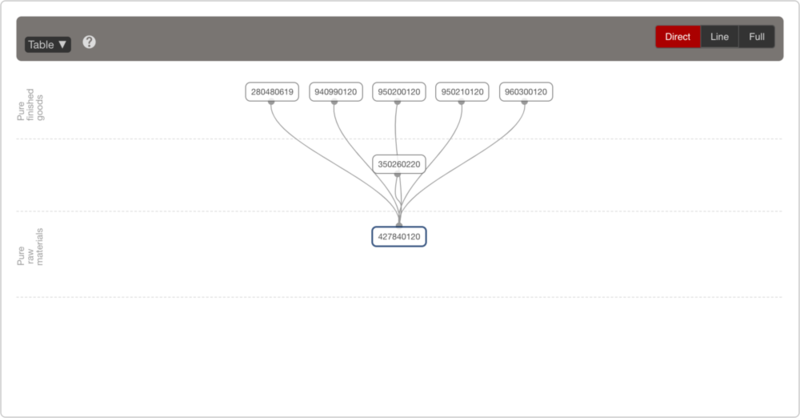 This is the most complex view of the BOM. Any order recommendations at sub-locations that the central warehouse supplies, roll up as dependent demand on the central warehouse. Clicking on an order quantity in the table, displays details of the actual expected arrival dates and quantities. In this example: the 6 units required by Branch Sa20 is actually two requirements for 3 units within the month. Clicking on the Branch Sa20 link will open up the enquiry for this product in Branch Sa20. 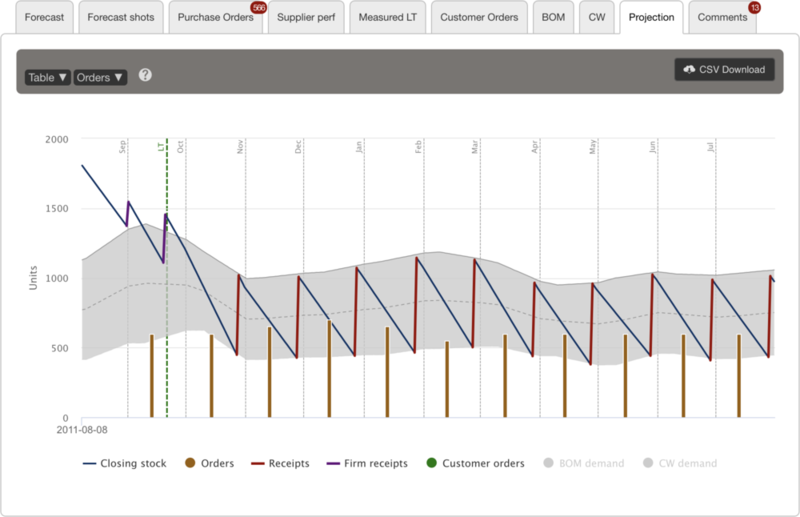 The Projection tab displays a projection of the future stock position, orders and receipts on this product. By clicking the labels in the legend, you can turn ON/OFF that element. For example: by clicking the word Orders, the graphic now displays when the recommended orders need to be placed. Each order (yellow vertical lines) marries up with the arrival of the order (red vertical lines). The Table button displays the data that is used to generate the above graphic. As you scroll down through the table data, each day is highlighted if it falls within the lead time (LT), safety stock (SS) or replenishment cycle (RC). Note: the image has been abbreviated to show LT, SS and RC days in one graphic. The information contained in the projection (table and orders) can be downloaded to a csv file by clicking on the CSV Download button. The Comments tab is where notes can be entered against an item, alerting other users to important information regarding this product. Note: the comments tab on the enquiry shows all comments that have been made against this item over time. Comments may only be deleted by the user that added the comment. A speech bubble next to the product code in any listings within the App, indicates that at least one comment exists for this product. Clicking on the speech bubble will display the last three comments.